According to the Insurance Institute for Highway Safety, motorcycle riders are 26 times more likely to be killed in an accident than the occupants of a car. Motorcycle accidents injure and kill far too many people every year. 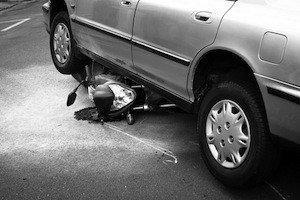 The most common type of motorcycle accident is a collision between the motorcycle and a car. Most of these accidents are head-on collisions. Factors such as poor visibility, inexperienced riders or drivers, excessive speed, and alcohol usually cause collisions. One common collision scenario is when cars are making a left turn and fail to see a motorcycle continuing straight. Another common type of motorcycle accident cause is lane splitting. Often, cars do not see motorcycles riding between the lanes and then crash into the motorcycle when attempting to change lanes. Motorcycle riders are also in more danger from road hazards than drivers in cars. Anything from a pothole to a dead animal can mean more than just a bump in the road for a motorcycle rider. Road hazards can mean loss of control and a crash. Motorcycles lack many of the safety features common in cars and other enclosed motor vehicles. There are no airbags or crumple zones on a motorcycle to absorb the energy from a crash. Motorcycle riders are not restrained by a seat belt and can be thrown into the roadway during a crash, therefore putting them at risk to being run over by other drivers. Even though motorcycle riders are not any more likely than the drivers of cars to be at fault for an accident, it often falls on motorcycle riders to be the ones who work to reduce injuries and prevent accidents. The easiest and most effective ways to prevent accidents is to be extra vigilant. Never assume another driver sees you. Allow yourself extra space when on the road. Obeying all traffic laws and regulations, especially avoiding excessive speed and any alcohol before riding, will also help keep you safe. Study after study has shown that wearing a helmet is the best way to reduce injuries in a motorcycle accident. Because riders are so exposed, always wearing closed toe shoes, long pants, and a thick jacket also help to reduce the severity of injuries in motorcycle crashes. If you or your loved one has been in a motorcycle accident, you need to speak with a knowledgeable Westport motorcycle accident attorney right away. Call Richard H. Raphael, Attorney at Law, at 203-226-6168 to schedule a consultation today. You may only have a short period of time to protect your rights.